Nokia, a global leader in creating the technologies that connect the world, together with its world-renowned industrial research and innovation engine, Nokia Bell Labs, was today announced as Technology Partner to UK-based sailing team Alex Thomson Racing. The ground-breaking new partnership, which continues through to 2021, will see Nokia Bell Labs join forces with skipper Alex Thomson and his team, as he looks to become the first British sailor ever to win the iconic Vendée Globe race. When the race reaches the depths of the Southern Ocean and skippers pass Point Nemo, they find themselves closer to the International Space Station than any being on earth, making communications capabilities crucial and emergency rescue virtually impossible. One of the toughest sporting challenges in the world, the Vendée Globe is a 24,000 mile solo, non-stop unassisted race around the world. The challenge sees skippers battle through vast, unpredictable waters and brutal conditions, with winds up to 70mph and mountainous waves. When the race reaches the depths of the Southern Ocean and skippers pass Point Nemo, they find themselves closer to the International Space Station than any being on earth, making communications capabilities crucial and emergency rescue virtually impossible. Through the partnership announced today, exceptional minds from Nokia will explore onboard and shore-based technologies and systems in a bid to enhance the performance capabilities of the sailing team. In doing so, the project will align with Nokia’s ongoing focus to push technology limits to support mission critical networks in the 5G era. through to networks and communications capabilities, the partnership will seek to discover and create the technology of tomorrow. 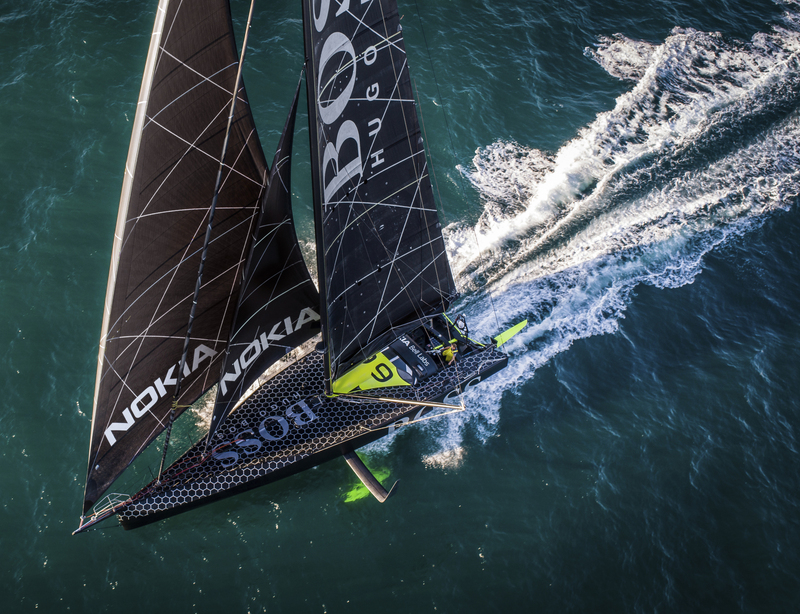 The partnership will see Alex Thomson Racing’s current boat, HUGO BOSS – which the skipper raced to a second place, record-breaking finish in the 2016-2017 Vendée Globe – feature the iconic Nokia brand. When the team’s new multi-million pound race boat is unveiled in June next year, meanwhile, the Nokia brand will continue to sit alongside that of the team’s long standing headline partner, HUGO BOSS. Stewart Hosford, CEO of Alex Thomson Racing, said: “As a team, we pride ourselves on being true innovators and one of the most ambitious, forward-thinking teams in the sport of sailing. It was clear from the moment we met Nokia Bell Labs that ambition and innovation are also at the heart of everything they do and so we could not have found a partner more suited to us. “Technology, analytics and data are now more crucial to our performance than ever before. Today’s IMOCA boats are some of the most technically advanced machines in the world of sport. This is evidenced by the Volvo Ocean Race’s decision to move into foiling monohulls under the IMOCA class, another exciting step forward for our sport. This is therefore the perfect time for Nokia to enter this space, and to explore the wealth of opportunities that exist for research and development.